SMOS+SOS researchers have examined the El Niño-Southern Oscillation (ENSO) signatures on SSS maps over the Tropical Pacific Ocean. Hasson et al (2014) have used a combination of numerical model output, in situ data and SMOS satellite salinity products. All salinity products showed good agreement with each other, with a RMS error of 0.2-0.3 between the thermosalinograph (TSG) and SMOS and/or model data. In general, the region remained in a cold La Niña phase from mid-2010 to mid-2012. Hasson et al (2014) shows that the near-surface salinity over the western Tropical Pacific basin is characterized by an unusually strong tri-polar anomaly during the last 6 months of 2010. A positive SSS anomaly sits north of 10ºS (>0.5), a negative anomaly lies between 10ºS and 20ºS and a positive one south of 20ºS (Figure 1). 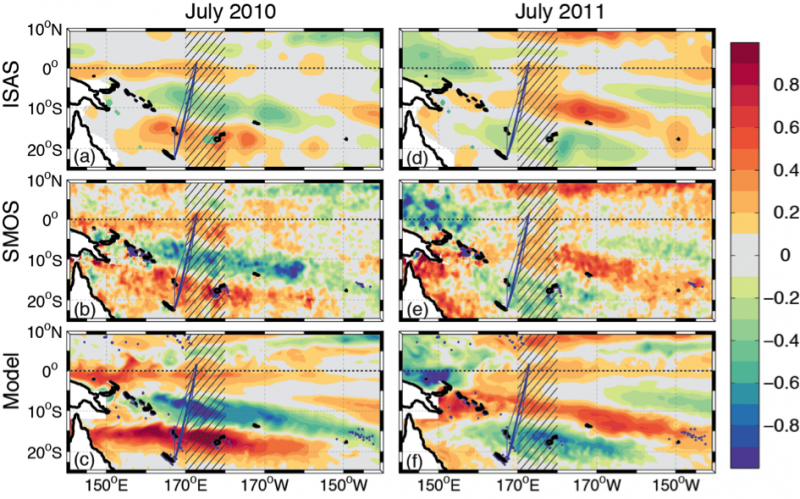 Figure 1: Sea Surface Salinity anomalies relative to each product 2010-2011 monthly climatology (pss) for July 2010 (left panels) and July 2011 (right panels), based on: (a, d) ISAS in situ product, (b, e) SMOS, and (c, f) model output. Blue lines represent the Voluntary Observing Ship routes and the 170°E-180° hatched areas computation zones (Figure from Hasson et al., 2014). In 2011, the anomalies move south and amplify up to 0.8, except for the one south of 20ºS. Equatorial SSS changes are mainly the result of anomalous zonal advection, resulting in negative anomalies during El Niño (early 2010), and positive ones thereafter during La Niña. The mean seasonal and interannual poleward drift then exports those anomalies toward the south in the southern hemisphere, resulting in the observed tripolar anomaly. The vertical salinity flux at the bottom of the mixed layer tends to resist the surface salinity changes. The observed basin-scale La Niña SSS signal is then compared with the historical 1998-1999 La Niña event using both observations and modelling.